We met at the McDonalds in Dali, where you can take your household pets. We had originally had thirteen people slated for the ride, but on Friday and Saturday morning eight backed out, leaving just five of us: Dom, Drew, me, Jeff, and Andrew Bott. Just like 2010, Saturday was an overcast day. We took off down the 3 to Jhushan, where we waited for Jeff Miller coming down from Taipei to catch up. We also waited out the rain there as well. The rain fell on us, but only briefly, as we turned south onto the 149. Here we pass through the town of Bu Zhi Chun -- literally, "doesn't know spring." My favorite town name in Taiwan. Jeff rocks 149 with his patented Shower Cap Helmet technology. The 149 itself is a very pleasant ride through tea farms. It climbs gently upward, offering excellent views. Highly recommended. From the 149 we turned onto the 149乙. That road is probably gorgeous, but I've never managed to be on it on a beautiful sunny day. A few minutes after you get on the 149乙, it begins a sustained climb up a series of steep switchbacks, deceptively demanding. Last time I burnt myself out pushing up this. This time I took it a lot more sedately, spinning slowly up and conserving my energy. There was still lots of climbing before we reached the tunnel above Caoling at 800 meters. The sun struggled to come out, but failed. Drew spotted a crested serpent eagle hanging out on a branch. The 149乙climbs along one side of a river gorge, which I think is called the "Ten Thousand Year Gorge." On the west side we could see the 149甲, which we rode a couple of years ago. Really a lovely area. Finally you reach the top and roll downhill to the 149甲, which now crosses the gorge and climbs to meet the 149乙after being wiped out by typhoons a few years ago. The 149甲climbs to the junction. A sudden outburst of zaniness at a stop for drinks before the final climb up to the tunnel. Roadwork is incessant up here and repairs will take years. The views down the gorge are staggering. Near the tunnel the road was totally destroyed and even now exists as more of a promise of a future road than an actual paved surface. Potholed and dusty from tourist buses going into Caoling, it is unpleasant on a bike. Through the tunnel and overlooking Caoling. Here we waited while I took stock. I felt great -- last time I was totally beat after the long climb. I had spun slowly up, conserving my energy. Yet there was climbing to come this day. Caoling. The hotels were full here, so we planned on going all the way to the aboriginal hamlet of Laiji at the base of Alishan on Saturday. Drew waits out a bus heading downhill past a new hotel going in. We descended past Caoling down to the riverbed and spun through the gorge. More awesome mountain views. Jeff takes in the scenery. ...towards Laiji. Only three kilometers to go! We rode three kilometers and reached a town, but it wasn't Laiji. Once again, we had been snookered by the Taiwan road sign makers. Apparently that was to the township line. Yes, we still had another eight kilometers or so. Of climbing. As Dom put it, "after all these years of riding in Taiwan, why do we still believe the road signs?" It was dark when we finally reached our B+B. I was terribly worried and unhappy with Drew's choice. Often up in the mountains the B+B offers dinner, but it is full of fatty foods, low in protein, and insufficient in quantity for the next day's ride, yet there is no place else to eat or buy quality snacks to compensate. I waited cynically for the owner's explanation of why they had no hot water, another common lack in mountain B+Bs. Breakfast is invariably rice porridge, perhaps my least favorite Taiwanese food. I was completely wrong in all my fears. Dinner turned out to be a copious spread of meats and veggies which we couldn't finish, while the hot water heater was clearly nuclear powered. Meanwhile there was a genuine breakfast place in the B+B with a coffee machine that served real coffee. The price was incredibly cheap, especially considering the value we got for the money: five of us paid $4500 in total for four rooms, dinner, breakfast, and sundry beers and other drinks. This place rocks, highly recommended. Drew had chosen perfectly. I got up at dawn, as usual. It was obvious that the bike gods had rewarded the faithful with glorious weather. 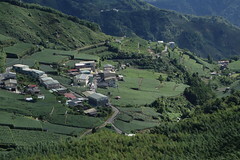 Alishan Laiji in the morning. On Sunday morning everyone was in their Sunday best. The first order of business: return to the 149甲. 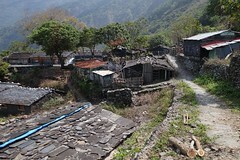 Laiji village, morning. I had only my Canon Powershot SX260 HS with me, I didn't bring the DSLR to save weight. One of the great things about climbing Alishan is that you face this massif, Siangshan, the whole way. It becomes more and more stirring as you rise. The 149甲 rises in a series of steps up 5 kilometers to join the 169. 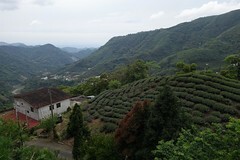 The inclines are generally about 8%, not difficult, and the views as you ascend into the fields of tea and betel nut are amazing. The bike gods reward the faithful with a gorgeous day. I might look grim, but I was really enjoying this ride, spinning slowly up. Drew had chosen our B+B perfectly; this road is much easier than the 169. Morning sun on the mountain. Parked cars and motorcycles revealed tea workers hard at their jobs in nearby fields. In no time at all, it seemed, we reached the 169. The 169 presents a series of brutal grades, 11%, 9%, 15%, all apparently underestimated by the signage. Although it is not clear in the pic, the sign warns of a 15% grade. The top of that was the only time on the 169 that I really needed a rest, however. Up we went through the tea farms. Drew clears a hill. It is sobering to think that Drew rocked this ride easily on his 53-39 compact dual and 11-27 rear cassette. In fact, he's done this entire route and back to Taichung from Chiayi in a single day: little 250 km day ride. Dom counts coup at one of the overlooks. One of the most quietly powerful riders I know, Dom killed this road. Picking tea at about 1300 meters. A land contoured in tea. At altitudes above about 600 meters, the spiders all seem to form colonies. Reaching another overlook. What a monumentally beautiful day. Not Photoshopped. We were a handful of kilometers from the top and I felt great. Spun the whole way up, trying not to push like last time. The results were clear: I felt great. A couple of more kilometers through the bamboo forest and we reached the summit at over 1600 meters. On to Fenchihu! Looking down to the tourist trap of Fenchihu. In Fenchihu we had coffee and rested before going on to Shijhuo and lunch. 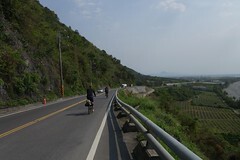 I had left Laiji at 8:40 and reached Fenchihu just after 11, the whole way on the bike. So easy it was an anticlimax. Dom blasts down to Shijhuo. Andrew Bott rolls into Shijhuo. 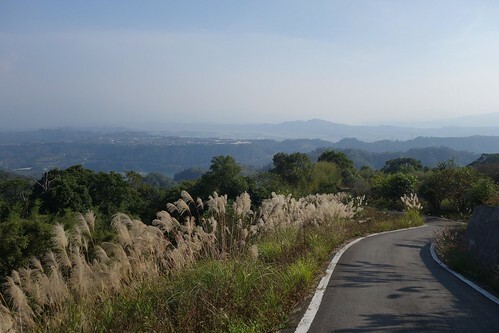 After lunch, we turned onto one of most beautiful roads on Taiwan, the 159甲. It's nearly forty kilometers to the train station in Chiayi city, and until you reach the outskirts of the city, every kilometer is stunning. If you haven't done this road, you need to. There are places to stay and a few small communities. This is in the town of Guanghua. Descending out of the tea fields and into the betel nut plantations. Last time I described this road as "a meditation on beauty in the form of a road." No pix can do justice. Sorry, out of adjectives for the 159甲. Eat your hearts out, everyone who stayed home. In the kingdom of the betel nut. No picture can capture the effect of a whole mountainside of betel nut trees. Heading down to Chiayi city. There's one long and surprisingly steep climb on the 159甲. After that it is 14 kilometers downhill to the city, and another few to the train station. Andrew buys tickets. The train station in Chiayi uses this bizarre system that no other station I've been to in Taiwan uses. If you are riding the local train with the bike, first you have to register the bike at the information desk (naturally there is no sign anywhere telling you to do this). Then you have to take the registration papers over to the ticket counter and buy the tix. Then you have to return to the info desk to return the paper. The nearest I've seen to this needlessly complicated process is in Taitung, where you also register before you buy (but there is no paper). Everywhere else I've been, you just buy the tix and go. I told the girl at the counter that this is the only station I know that does this, and she replied tartly that everyone else was doing it wrong. An incredible weekend, and I owe it all to the patient teaching and friendship of my man Drew. Thanks for making this possible, sir. You're a rock. Next time hope to see you! Map of today's ride. Looks like a great ride. Do you have a name or a phone number for that place in Laiji for anyone else who might be interested in doing that ride? Buzhi Chun is a great name. My personal favorite is Chelutou (車路頭), End of the road, in Toucheng. It really is where the road ends. Drew has contact info. I'll make it gets on his post and link to it. What a great ride. Thanks for sharing the pictures! Pics are breathtaking. 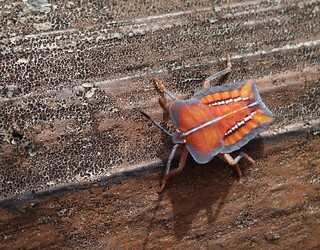 What planet is this?